What can we learn from an octopus about collaboration? John Buck presents valuable new insights for teams wanting to share leadership and get more done, in his new TedX talk at the University of Maryland. John has been helping organizations all over the world to create more democratic workplaces – with more transparency, adaptability, and shared leadership — and to produce remarkable results in their communities. He has consulted with schools, universities, healthcare providers, software companies, materials manufacturers, professional organizations, and ecovillages. He is co-author, along with Sharon Villines of the book, We the People: Consenting to a Deeper Democracy, as well as co-author with Jutta Eckstein of the recently published book, Company-wide Agility with Beyond Budgeting, Open Space, and Sociocracy. 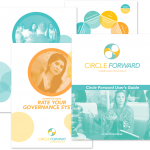 We are grateful to John and Sociocracy (aka Dynamic Governance) for introducing us to the principle of Consent as the basis for decisions — one of the transformational principles in the Circle Forward system of collaborative governance. John Buck is a co-founder, mentor and inspiration in this leading edge work. He really is a rock star!